Creating a Path from Chronic Illness to Healing: You Can Do It! Why Lyme disease is called ‘the great imitator’ and how this disease epidemic is so widely under-recognized and undertreated. How to discern, access, and assemble a team of specialized health care resources to get the expert help you need to thoroughly evaluate you, pin down your diagnosis, and get you going on your recovery. Why the learned skills of being your own advocate, maximizing your daily function and increasing your self-awareness are necessary at every stage of your health care path, and solid tips for building those skills. Ways to make sense of the wide range of thoughts and emotions that you’re experiencing with your health challenges, so that you can live your life from a place of deeper personal power and self-acknowledgement. Links to valuable resources for further learning and support, so that you can get started right away on your path back to health. and what they can do to feel better. Although this book begins with a focus on my own experience with Chronic Lyme Disease and its frequent misdiagnosis, the valuable insights and suggestions in it apply to people living with many different kinds of serious chronic illnesses. as well as showing you the value of exploring the untapped potential within yourself. is a key piece of your overall health recovery. You are more powerful than you may realize in being able to create better daily function. to a sense of mastery and control, so you can create greater healing and a better life. There is always hope for new answers to your health. Persevere! Lisa Dennys is an author, life coach and intuitive personal growth catalyst who has worked in health care and personal transformation fields since 1977. Her previous professional careers, as a Dr. of Chinese Medicine & Acupuncture and an Occupational Therapist, have given her a unique, holistic perspective on health and illness. For over 30 years, Lisa has dealt with her own serious health concerns. A determined health detective, she has sought answers within and outside of the conventional medical system. After several decades of exhaustive and frustrating self-directed investigation and repeated misdiagnosis, she was finally diagnosed with chronic Lyme disease in early 2015. Her long path to a diagnosis, and now finally into treatment and recovery, has encompassed many challenging experiences and created deep personal transformation. Lisa strongly believes that building greater self-awareness can create amazing life and health transformations. She guides people with chronic illness (including those with suspected or confirmed Lyme disease) to compassionately explore inside themselves. Here they find their strengths and build the strategic step- by- step skills needed to forge a path to better health and greater peace of mind. Unveiling Lyme Disease is a well written and researched, plain talk patient guide to diagnosis, treatment, and day- to- day coping with the “great imitator", Lyme disease. Dennys, a former occupational therapist and Chinese medicine and acupuncture practitioner, provides a clear and compassionate roadmap for navigating tick-borne diseases especially for Canadian patients. Readers will be especially moved by her own harrowing 30 year struggle to finding answers for her multiple symptoms and her lessons will be helpful for the hundreds of thousands of others struggling with tick-borne and another chronic disease. I highly recommend this book. 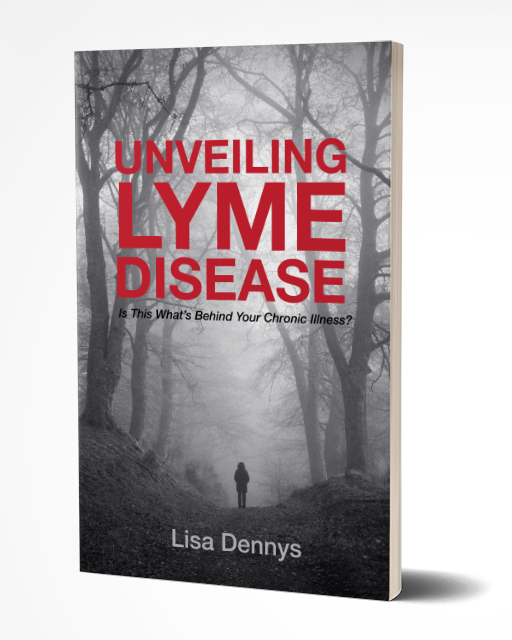 Unveiling Lyme Disease by Lisa Dennys is a succinct, user-friendly guide that will fast track your search for finding the answers and help that you need to get you on the road to healing. She not only helps you free up the shame associated with chronic illness by validating your struggle, but also works to empower you with step by step directions for cutting through the confusion of diagnosis, and the development of your healthcare plan. If you are suffering from symptoms that will not resolve and are beginning to suspect Lyme disease, I recommend this book as your first step to empowerment and healing. Please email me here for general inquiries. I’d love to hear from you!